I haven't been to much live comedy in my life. I saw Yakov Smirnov way back in college, David Sedaris back in 2010, and went to a local improv show in Ventura, CA during our Route 66 trip. So I wasn't sure what I would experience when I went to see Amy Schumer in the Centurylink Center (same venue as the Mumford & Sons concert a few days earlier). The Wife was not with me. Amy Schumer can be a bit risque and the Wife was worried that it would not look good for a Catholic School teacher to be seen there. My first impression as I sat down was I was surrounded my an inordinate number of women. Eventually I saw more men coming in so I didn't feel so out of place. The show started a bit late with Amy Schumer's brother's avant garde jazz band. Not a big fan (but not as bad as Mumford & Sons' warm up band). I prefer more structure to my music. The jazz was following by a short set from Rachel Feinstein. She was ok. Made me laugh a few times. She was promoting her new special on Comedy Central. The show is titled "Only Whores Wear Purple." Ouch! Two days after the death of Prince. Talk about bad timing. Amy came on and delivered a pretty good hour long set of raunchy humor that often made your toes curl ... in a funny way. The laughs came at a good consistent rate. The only thing that fell a bit flat for me was when she tried to tie in her material with Omaha/Nebraska/Iowa. It felt she'd done her research in the big book of stereotypes. Lots of corn and cow tipping jokes. I enjoyed the show. The Wife would have liked it I think. Now to start watching the new season of Inside Amy Schumer. Before most of our trips, Cuba included, my anticipation is slow to build. I don't get excited until I'm about to leave. For our next trip, only a month and a half away, my feelings have flip flopped. I started thinking it would be a ho hum trip but, now I am getting more and more excited. I'm ready to go right now! My anticipation is only tempered by the possibilities of disruption. The last couple of trips have had one issue or another right before we left. Before our China trip it was a change in the Chinese government policy concerning Tibet. The result was the addition of Bhutan to our itinerary only a few weeks before we left. Our Africa trip was almost changed by an act or terrorism in Kenya. We were contacted by our tour operator and asked if what had happened would change how we thought about the trip. It didn't and, in the end, the tour went as originally planned. So ... what's up with our South American trip? Let's see. A Nebraska couple died of smoke inhalation on an Amazon river cruise similar to ours. The Brazilian Chamber of Deputies voted to impeach the President. The impeachment order is now going before the Brazilian Senate. A portion of a bike path that was built in Rio as part of the Olympic infrastructure collapsed killing two. These are nothing compared to the 7.8 earthquake last weekend in Ecuador. Oh ... and there is Zica. So far there are no changes to our itinerary. Let's hope that stays that way because, darn it, I'm excited! Tuesday night the Wife and I went to a Mumford & Sons' concert at Omaha's Centurylink Center. It turned out to be a nice evening. The warm up act was Blake Mills. I didn't get his music. It seemed chaotic, non-melodic, and had little rhythm. It was hard to tell one song from another. This resulted in Blake Mills replacing Girls With Guns as the worst warm up act I've ever had the misfortune to experience. We left part way through to get some eats and drinks. By the size of the crowd outside the arena we weren't the only ones who didn't get Blake Mills' music. Mumford & Sons took the stage and pretty much wowed everyone. Everyone except the loud a$$ed lady behind us who had to talk loudly to her boyfriend/date through most of the show. Even my death stare failed to quiet her. Despite the loudmouth we still enjoyed the concert. You could feel the energy in the crowd as they lit up the arena with their phones and sang along with the songs. It was fun when Marcus Mumford (the lead singer) ran through the crowd, up the stairs not far from us and went up into the upper level singing the whole way. It was nice seeing him mixing it up with the fans. We both really hadn't done our homework. It always helps to know the music of the band you are listening to. I knew of Mumford & Sons but I only recognized three songs the entire evening (not including the cover of Bruce Springsteen's "I'm on Fire"*). The Wife only recognized one (plus the cover). We both enjoyed the concert but we would have enjoyed it more if we'd been familiar with more songs. * Embarrassing story: We both recognized the cover song but for the life of us neither of us could think of who sang it. When we got home and Googled it we were like D'OH! Major couple senior moment. Saturday night the Wife and I went out to eat. We went to a place I'd been thinking about since returning from my first Camino back in 2011. Yes ... I can take a while to turn ideas into reality. The place is the España Tapas Bar & Restaurant in the Benson area of Omaha. The restaurant serves Spanish food specializing in Tapas and Paellas. I was there mainly for a dish that I ate a lot of in Spain on my two Caminos: Tortilla Española. Tortilla is a thick omelette made of potatoes, onion, and eggs all fried up in oil. I first heard of it in the town of Navarette. I tried it soon afterward and I was sold. I was a bit apprehensive when they brought out two slices for the Wife and I. Would it be as good as I remembered it? Oh yeah. It was. The Tortilla tasted just like what I'd had in Spain. The potatoes were cut a bit thin compared to the chunkier style I'd had in Spain but it was still awesome. The Wife had never had it and you could see her eyes light up after she took her first bite. She liked it just as much as me. This may be the first time I have introduced a food to her instead of the other way around. Along with the tortilla we ordered skewers of sirloin and chicken along with cheesy fries with a pepper salad. This sounds like a lot but in a tapas restaurant, each plate is rather small and meant to be shared. We ordered four dishes and we shared from each. Next time we probably should go for five dishes though - I was full but a little more would have finished me off. Every dish was delicious. In California the Wife and I used to go out to eat once a week. We have slowly dropped this habit. Each time we do go out we comment on the fun we had and how we should go out more often. I hope we can restart this old habit once again. Scuba has been on my list of things to do for several years. On Monday I finished the class/pool portion of my scuba certification classes (called Open Water Diver certification). To complete my certification I have to perform four dives within a year of completing the class work. DiVentures holds certification dives in a flooded quarry near Atlantic, IA. It takes a weekend to do the four dives. I hope to fit it in before our South America trip but it may be better to wait until I get back ... the water will be substantially warmer in July or August. "So ... now that you've completed the first part of the training, what do you think?" My instructor asked me this after the last session. I had to pause before I answered. Frankly, I'm not sure how I really feel. I thought that I would get more excited as I took the classes but that is not what happened. Obviously scuba diving at the bottom of a fourteen foot pool doesn't come close to the diving in the real world. The skills we learned were relatively easy. Things like clearing your mask underwater, recovering a lost regulator, and sharing air if you have the misfortune of running out of air. As I progressed through the five class sessions I couldn't help feeling like scuba was not for me. The thing about scuba are the potential risks involved. It is a fairly safe activity but, when something does go wrong, you can have serious consequences ... drowning being one of them. You mitigate these risks by knowing your equipment intimately and always diving with a buddy. To know your equipment means you must buy your own equipment. You can never fully understand rented equipment. Scuba ... it isn't a cheap activity. You also have to travel to fully experience scuba. I can not see myself spending money just to fly somewhere to scuba dive. I don't have resources to support that even if I wanted to. I hike alone. I camp alone. I bike alone. You can't scuba alone. For me, this is a limiting factor. There is one more thing. When I was a little kid at the Lake of the Ozarks I loved to swim. When I was in the water I was in my element. After we moved to Guatemala I swam less and less. Some of this was a lack of opportunity but a lot of it was me. I just didn't want to swim as much as I used to. I swam some when I was in college but after I graduated and entered the real world swimming just didn't have the hold it once had. Case in point, the In-Laws have a lake house on a small lake in Iowa. In the almost nineteen years of our marriage we have visited the lake many times and I have never gotten into the lake. I'd hoped that the scuba class would rekindle the feelings I once had when I was younger. It did not. So, Have I wasted the money and time to do the classes? No, I still don't think I have. You never know if your are going to like something until you try it. I will complete the certification later this summer (yes ... I am fighting the urge just to blow it off) because there will be chances to use the skills someday and the certification is for life. Maybe a return trip to Zanzibar or an excursion to the Great Barrier Reef. A trip to Belize or the Mediterranean. One never knows what lies around the next corner but at least I will be ready if the opportunity arrises. Have you hugged your Unicorn today? Why Not? 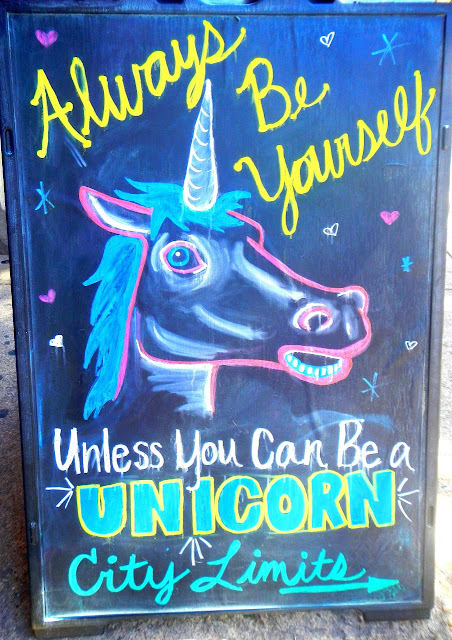 It's International Unicorn Day! I think it's been mentioned a few times but I will say it again. I am solar powered. Today was a gorgeous day with temperatures in the 80's (>26°C), clear skies, and a stiff wind blowing. I could feel my mood going up most of the day. This a is a good thing as my mood has been a tad gloomy for the past month or so. The sun started making it's appearance on Saturday. I mowed the lawn for the first time this year and did some tree trimming I'd been thinking about for some six months. I wasn't outtside very long but it felt refreshing. I took advantage of the even better Sunday weather and took my bike off the stand and went for my first ride in the real world since the end of RAGBRAI. Back then I said the bike would never come out of the basement. I guess I spoke too soon and a bit too rashly. I still am not a fan of bike riding but it has been good for my health and I hope to start riding again. The wind kept my first ride of the year short (10.8 miles, 17.4 km) but it felt good. My plan now is to work my way up to sixty or sixty-five miles over the next six months. Hopefully I will ride two to three times a week to help build up my stamina. We'll see how this plan does. Speaking of exercise, my second scuba class went pretty well. In my last post I said that I swallowed half the pool water due mostly to snorkel issues. On Wednesday I adjusted where the snorkel was attached (it attaches to the left side of the mask strap - I moved it farther forward on the strap). The new position allowed the mouthpiece to sit better in my mouth preventing the little stream of pool water that dribbled into my mouth during my first class. We continued doing basic drills in the pool. Things like clearing water from your mask and recovering your regulator after it comes out of your mouth. So far everything has been pretty simple. My main issue is, when the regulator is out of your mouth, you should keep blowing bubbles to help balance the pressure in your lungs. I keep forgetting. Despite this, the instructor said I was doing pretty good. Yay for me. The low point of the last week was Friday. It was overcast, dreary, and a little drizzly. I'd planned to go for a walk. I'd even mapped out my route. When Friday morning came I just couldn't get myself out of the house. I dusted and vacuumed the house instead. So the last week was a bit mixed when it comes to exercise and mood but there was more good than bad so I'm optimistic. Spring feels early this year ... not a moment too soon if you ask me. The great weather is not forecast to last into the week but this solar charge should last me for a few days at least.